Real Madrid didn't waste the chance to go 4 points clear of Barcelona this weekend, after an easy 3-0 win at home against Levante. The Merengues managed to score early in the game through a great header from Cristiano Ronaldo and then consolidated their lead with second-half goals coming from Marcelo and an own goal from Niko. Few times this season have Real Madrid and especially Diego López gone through such a quiet evening in a league game. Levante visited the Santiago Bernabéu holding the 8th place in La Liga, but not only they've lost 3-0 to the hosts, as they've also been extremely poor in terms of producing any attacking football plays. With this victory, Carlo Ancelotti's men go again 3 points clear of Atletico Madrid (2nd), and have set a new season-high gap to Barcelona of 4 points, who lost their weekend's fixture yesterday, against Valladolid. Cristiano Ronaldo drew the first blood of the game still inside the first quarter of an hour, but the 3 points were only completely secured after Marcelo's first goal of the season and a late own-goal from Niko. The UEFA Champions League returns this week, with the biggest clashes being a thrilling Barcelona vs Manchester City at the Camp Nou on Wednesday, and a promising Bayern Munich vs Arsenal right this Tuesday. The Merengues second leg game against Schalke 04 is only scheduled for the week after, which means their next match will be an away fixture against Malaga for La Liga, booked for next Saturday. After Barcelona's unexpected loss against Valladolid this past Saturday, the Merengues looked at their fixture against Levante as a golden chance to leave their archrivals in a delicate position in La Liga. Ancelotti pulled out all the guns he had at his disposal right from the start, delivering most of the attacking duties to Gareth Bale, Karim Benzema and Cristiano Ronaldo. The only changes in the starting eleven when compared to the line-up presented in the game against Atletico Madrid in the Vicente Calderón last weekend, were done in the defensive line. Marcelo stepped in for Fábio Coentrão, Carvajal for Arbeloa and Varane replaced Pepe, who had some stomach flu problems earlier this week. As expected by almost everyone following the Spanish League, Real Madrid had no troubles in dominating Levante at home, proving once again that with the exception of that 0-1 loss against Atletico Madrid on September 28, the Bernabéu has been a true fortress for the Merengues. The hosts scored the opening goal around the 11th minute of the first half, through another splendid header from Cristiano Ronaldo. Angel Di María's took the corner kick on the left and the Portuguese all-time top scorer jumped higher than everyone else around him to head the ball straight into Navas' low corner. 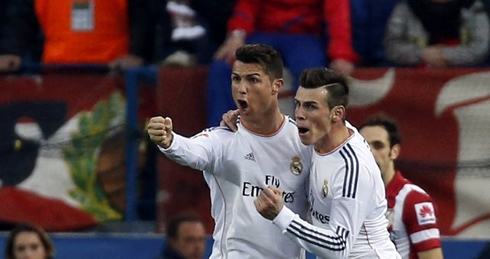 The 2-0 was set shortly after the break, after a beautiful attacking play between Cristiano Ronaldo and Marcelo. The two have proven to have a great understanding both on and off the pitch for numerous times, and when we add an immense talent on top of that, the result is what we've seen in the 49th minute. It all happened on the left wing, where Cristiano Ronaldo managed to draw two defenders near him after a quick run at the same time he created space for Marcelo to breach inside Levante's box. The Brazil international was then assisted by his teammate with a low pass, did one stepover to trick his closest opponent and then brilliantly curled the ball into the far post with an unusual right-foot strike. 2-0 on the scoreboard and there were no signs that Levante could still have any chances to get back in the game. As time passed, Real Madrid players seemed completely aware that Levante wasn't capable of posing any sort of threat this Sunday evening. Probably because of that, they've also seemed to settle with a low scoring lead and didn't exactly push forward too hard. 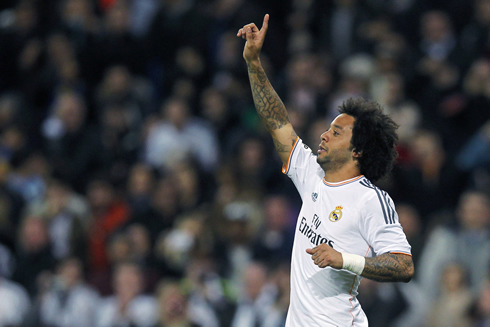 Nevertheless, the third goal ended up arriving in the 81st minute of the game, after another Marcelo raid on the left. The Brazilian left-back pulled off a cross to the far post and saw his opponent Niko sending it back to his own goal, after panicking with a possible presence of Ronaldo or some other Real Madrid forward near him. The result was therefore set on a conclusive 3-0 and Real Madrid was certainly happy to secure another 3 points, which allows them to be one step closer to finish first in the league by the end of the season. 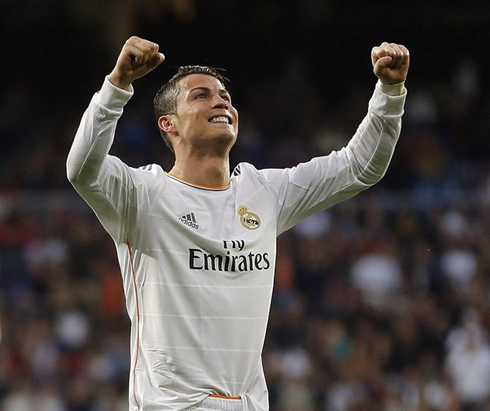 With tonight's goal, Cristiano Ronaldo has now scored 38 this season, 24 of those in La Liga. The Portuguese forward is also the league's top goalscorer with 24 goals (3 more than Atletico Madrid's Diego Costa, who didn't find the back of the net this weekend). 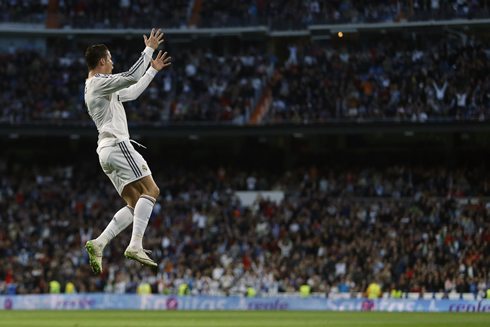 It was Ronaldo's 5th header goal for Real Madrid since the beginning of the season in August. As a note of curiosity, Ronaldo's last hat-trick for the Merengues was scored 25 games ago, on a 5-1 home win against Real Sociedad, on November 11 of 2013. Cristiano Ronaldo next game for Real Madrid will be against Malaga for La Liga, on March 15 of 2014. You can watch Juventus live stream, Malaga vs Real Madrid, Atletico Madrid vs AC Milan, PSG vs Bayer Leverkusen and Bayern Munich vs Arsenal, all games provided from our football streamings live section.